प्रधानमंत्री नरेन्द्र मोदी ने देश की अर्थ व्यवस्था को सशक्त बनाने के लिए कई तरह के नये कदम उठाये हैं जिनमें से एक हैं मुद्रा योजना. इस योजना का पूरा नाम माइक्रो यूनिट्स डेवलपमेंट एंड रिफाइनेंस एजेंसी हैं. इस नाम से ही मुद्रा योजना का उद्देश्य स्पष्ट हैं सही शब्दों में मुद्रा योजना छोटे उद्योगों को सशक्त बनाकर देश की अर्थव्यवस्था को दुरुस्त करने की योजना हैं. मुद्रा योजना के तहत छोटे उद्योगों को शुरू करने के लिए लोन दिया जा रहा हैं ताकि लोन ना मिलने के कारण उद्योगों में काम बंद ना हो. अगर छोटे उद्योग बढ़ेंगे तो देश में रोजगार एवम देश की अर्थव्यवस्था अच्छी होगी . Once a beneficiary sorts out an idea and comes up with business plan; he/she needs to select a certain business category under which he/she shall get the loan. Then beneficiary needs to contact with the nearest financial institution that may be public or the private sector banks that are authorized to offer this loan. The first step is filling up the application form and after that you need to show a photo identity proof. This can be any direct identity proof that is provided by the government of India. Without an identity proof, the loans shall not be granted. Also a proof of residence, proof of category, recent photograph, and quotation of machines and name of supplier needs to be given during the time of application. The primary eligibility criterion of this loan is you need to be a small business organization owner or a small or micro business owner. If it is not a small business organization, then, the loan shall not be granted. The amount of rupees is 10 lakh and for those who are in requirement of credit needs below 10 lakh, it will be applicable for them only. To offer maximum benefits for the micro business organizations and set up a good process for the last mile credit agent scheme that entirely for the small business set ups. It also offers credit guarantee for the one who has taken up a loan. This means that the person is not going into debts. The government is also going to bear the responsibility of the loan. There are agents who are hired under committee who are going to guide on how you are going to organize and process a business plan so that there are minimum risks for getting a negative result. All small business and unit sectors are placed within surveillance and regular evaluation shall be based on their performance. There are high possibilities that conflict might take place due to the type of responsibilities and roles offered by Mudra bank. RBI also has the right to offer loans to small and micro business organizations. Now, if both the institutions lend money to the small and micro organizations then the interest rate might clash. 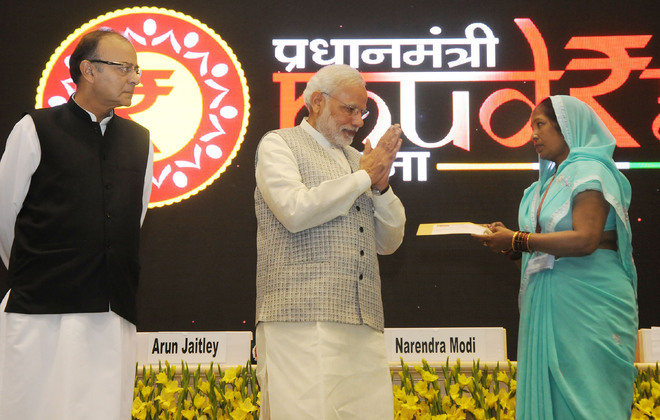 Mudra promotes shadow banking. Primary responsibility of Mudra bank is to regulate MFIs but RBI also regulates the MFIs. Thus there are two bodies now regulating the micro industry. This might create problems for MFIs. 1. Eligibility For those who credit needs are less than 10 lakh rupees. Credit needs for above 10 lakh shall not be met. Agents are hired within the committee for guiding the lenders on how to process a business plan so that minimum risks are involved. 3. Disadvantages Possibilities of conflict of interest because of the roles and responsibilities offered in Mudra bank. There are two bodies now that are regulating the MFIs. Thus it might create problems for the MFIs and also for the lenders. Mudra bank also promotes shadow banking.